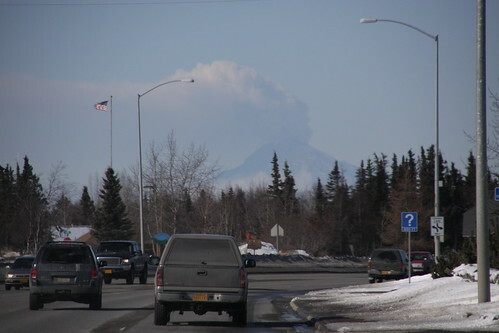 Redoubt erupted again today. This is not my greatest shot ever but I love seeing the volcano looking over our seemingly normal little town. For more SOOC Saturday check out Slurping Life. I wonder when it will stop. Hope you aren’t getting too much dust (or that you’re remembering to wear a mask when you go out!). So cool you live close enough to get pictures. I love that second shot, how soft it looks against the water. That second picture is great! I hope you guys are still ok out there. Has there been any problems? love the shots – glad it’s still not bothering you guys too much. Wow, gorgeous shots!! I especially love the second one…gives the illusion that it’s floating above the water like it’s part of the clouds. We have not had any ash, it has dropped just miles away from us but nothing on us. Complications? They have laid off UPS workers temporarily because of all the canceled flights. 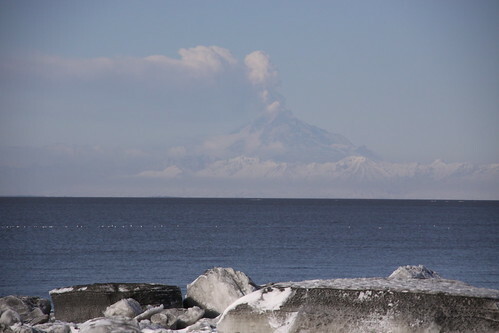 It is not erupting as often these days so hopefully that all gets back to normal soon. So Neat! Love the shots! Something I will probably never get to see in my lifetime if it weren’t for great pictures like this. Thanks! Despite the threat, these are beautiful images…especially the second shot. Through the haze it’s as though the volcano is a mirage, a dream. Good work. And stay away from it! Wow!!! It almost looks ghostly. wow…that is so crazy!! Are you a little nervous? Good Lord, that second shot is so dramatic! Be safe.